No doubt that the 2008 film You Don’t Mess with the Zohan was a funny movie, but some of the biggest laughs came from its grossly inaccurate portrayal of Israeli culture. This includes brushing teeth with hummus, going out at night to the discotheque, and carrying stock-loads of weapons in an electronics store. But one of the most memorable examples is a soft drink called Fizzy Bubblech. According to the movie, Fizzy Bubblech is a fruit-flavored soda with strong carbonation. While it gives Americans extreme gastronomical discomfort, the drink is enjoyed by Israelis and Palestinians alike. Sadly, just like many aspects of the film, Fizzy Bubblech does not exist, nor does it appear to be a reference to any specific Israeli drink. The closest match is Fanta and its many tropical flavors, but even that is a stretch. 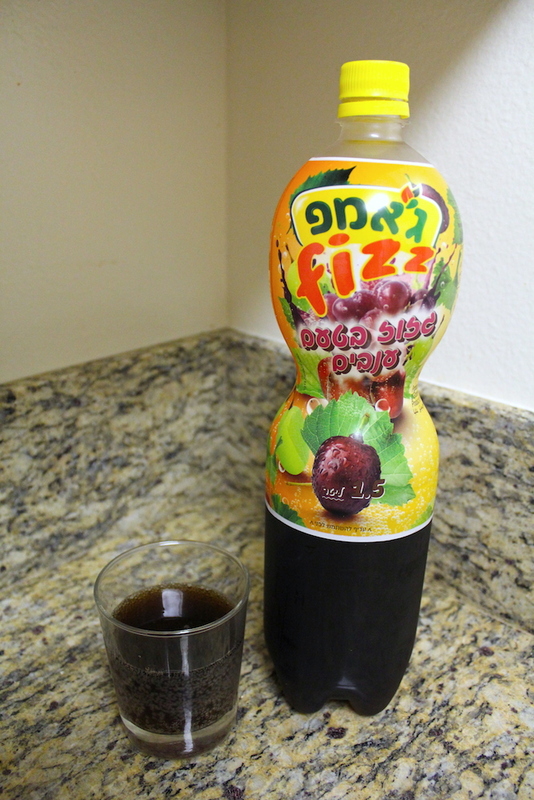 Yet a few weeks ago while shopping in a kosher supermarket, I discovered a drink that is pretty much Fizzy Bubblech, or the closest thing we’ll ever get to it. The name of the product? Jump Fizz. Apple was not available at my grocery store, but I decided to buy the other two flavors. Red grapefruit was my favorite, a unique flavor that went well with any meal. I was less impressed by grape, though it tasted much better and less artificial than American grape soda. While highly fizzy (the product name does not lie), it was not too strong for my taste. But taste aside, I cannot get over the fact that this is Fizzy Bubblech. I would be surprised if the manufacturer was not inspired by Zohan. Strong fruit taste, strong carbonation, even an unusually-shaped bottle design… how could it possibly be a coincidence? So maybe Jump Fizz not exactly Fizzy Bubblech, but it’s close enough to cross off my list of fictional soft drinks to turn real. Next up is Slurm, Alamo Beer, and Pan-Galactic Gargle Blaster. Whut? Its obviously satirization of mitz paz. How do u not get this? Blu makes a drink called Blu Day Bubbly.